Hello! We are Spooky Kool, and we are a Globally Recognized Phoenix-Based band. We write, record, and perform original compositions along with a sample of updated Jazz Standards. We released our first CD, “The Spirit of Spooky Kool, Conversation with God” in March of 2014, and our first music video, Americans (http://youtu.be/WdW2QtALEls). We released our latest album on September 8th, 2016, a collaborative effort entitled, “Do You Have the Time.” The albums reflect our experiences in music and life. The album performance is targeted for showcase in the Spring of 2017. The band is led by Writer, Composer, and Performer, Gabriel Bey. Phil Janzen is the band’s Co-leader and responsible for the group’s recording efforts and of course, beating the drums. Pete Mello performs with exacting precision on guitar. Then there’s the dexterity and speed of soloist Jack Schaar on Alto Sax, with the bottom groove of Ross Covington on electric bass. Sandra Bassett is the Music Director and the band’s keyboardist and featured vocalist. We are so excited to offer so many of our musical family, friends, Fans, and followers new music, sure to raise them out of their seats and dancing in the aisles. If just relaxing to ponder life’s meaning, our musical conversations are designed to elevate the spirit and promote joy and happiness. Whatever your musical pleasure, come get your groove on and experience first-hand, the music and art of Spooky Kool, Your Friend in the Spiritual Age! Head Boppin’ Jazz comes to The Listening Room Phoenix with the much-anticipated performance of Spooky Kool, Your Friend in the Spiritual Age. Here is your opportunity to see the live performance of Spooky Kool in your favorite settings, The Listening Room Phoenix. This venue was designed for intimate relations between artists and audience, so your experience will be up close and personal. The original composition that sets this band apart from cover bands and provides a message in the music like minstrels of the past. 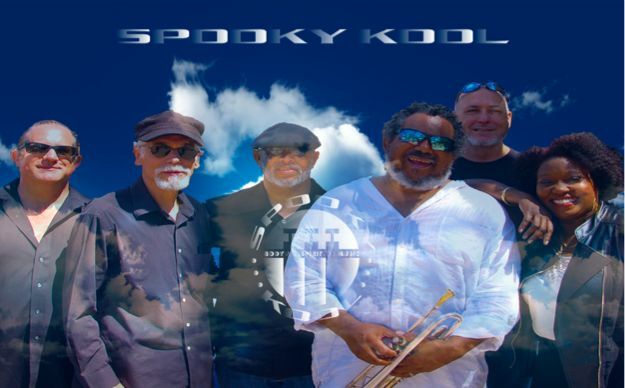 Spooky Kool will be featuring the sultry and powerful vocal of Sandra Basset, the grooving riffs of guitarist Pete Mello, the funky bass of Sir Ross Covington, and the beats of Phil Janzen. Let’s not forget the exciting performance of saxophonist Jack Schaar and featuring the trumpet and vocals of leader, Spooky Kool, aka Gabriel Bey.